Governor Scott Walker, shown here in August at the state Capitol in Madison, unveiled his goals for Wisconsin on Friday night during a speech in California. Gov. Scott Walker unveiled major new policy initiatives Friday night in a speech in California, including decreasing taxes, boosting the school voucher program and requiring Wisconsin’s schools, technical colleges and universities to meet certain benchmarks to earn state funding. Among the proposals was one to tie funding for technical colleges and the University of Wisconsin System with how well those institutions prepare students to take available and needed jobs in Wisconsin. The glimpse into Walker’s legislative agenda came at the end of an hourlong talk at the Ronald Reagan Presidential Library and Foundation in Simi Valley, Calif. Walker had been in Las Vegas for a meeting of the Republican Governors Association, where he was elected vice chairman. The speech was not covered live by Wisconsin media but was available on the Internet. Among those in attendance was one of Walker’s biggest campaign donors, Diane Hendricks of ABC Supply in Janesville. Walker’s talk focused on what the governor described as his successful initiatives to reduce the cost of benefits for public workers, improve the quality of education, boost the economy and maintain social services. After the speech, a woman who described herself as a "fellow Wauwatosan" asked what Walker planned to do now that Republicans had regained control of both houses of the state Legislature. "We’re working on massive tax reform," Walker said. "We think if we want to continue the economic success we’ve had over the last year and a half, again one of the best ways to do that is to put more money back in the hands of entrepreneurs, more money back in the hands of small business owners, more money back in the hands of our consumers." Walker added he plans to push for lower property taxes, which is the primary revenue source for schools and local governments. And he said he will propose "aggressive income tax reduction and reform." The Republican governor said his proposals for education reform will tie funding to outcomes, including how well the education system meets the need for trained workers. Walker said he has heard "tremendous concerns" from employers in health care, manufacturing and information technology "that they have jobs but they just don’t have enough skilled workers to meet those jobs." The governor said he plans to tie education funding to performance, ranging from kindergarten-through-12th grade schools, which now are evaluated by state-required report cards, to the technical college and University of Wisconsin systems. "What we’re going to do is not just put money in ... we’re going to make investments that are driven off of performance," Walker said. "We’re going to tie our funding in our technical colleges and our University of Wisconsin System into performance and say if you want money, we need you to perform, and particularly in higher education, we need you to perform not just in how many people you have in the classroom. "In higher education, that means not only degrees, but are young people getting degrees in jobs that are open and needed today, not just the jobs that the universities want to give us, or degrees that people want to give us?" Walker also said he wants to do more to help choice, charter and virtual schools in Wisconsin but offered no specifics. Senate Minority Leader-elect Chris Larson, D-Milwaukee said he was disappointed Walker chose to unveil some of his initiatives in California before Republican supporters and donors rather than Wisconsin residents. Larson said his impression from the talk was that Walker has no plans to moderate his stances and instead plans to continue a path of "divide and conquer." He contrasted Walker’s plans to "hyper scrutinize" public schools while giving more money to "unaccountable" private schools that studies show perform no better or worse than public schools. The Democratic lawmaker said Walker’s proposal for higher education funding sounds like "social engineering" that would force students to study "what industry wants" rather than what students want. UW System spokesman David Giroux said in the last state budget, the Legislature ended up for the first time giving the UW specific performance measures that it is required to report on annually. When the UW System put in a modest request for new funding in this biennium, it said specifically that it would tie the funding to new initiatives focused on workforce development and economic development, Giroux said. "In some respects at least, we’re already there," Giroux said. "We’re not just asking for new money carte blanche. We’re asking for state investment. And we are promising to deliver a return on that investment." 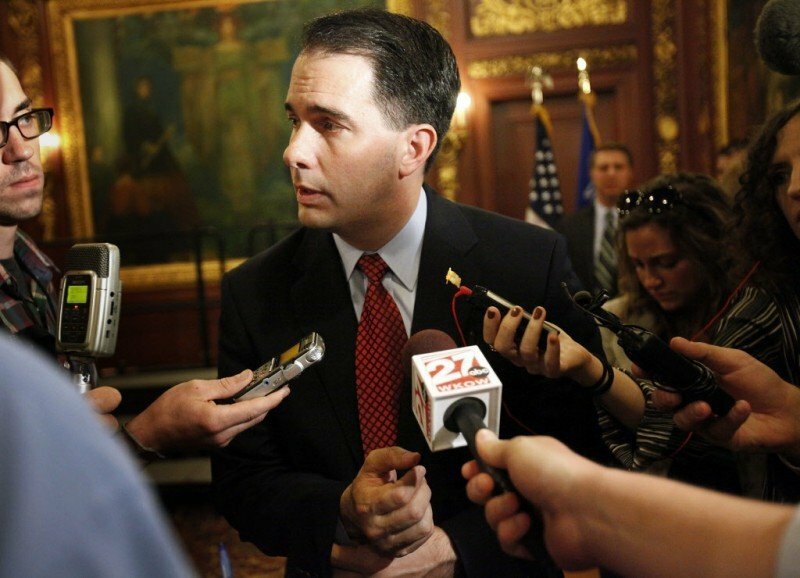 Christina Brey, spokeswoman for the Wisconsin Education Association Council, the state’s largest teachers union, said it’s one thing for Walker to give lip service to world-class schools and it’s another thing to back his words with actions. "The actions we’ve seen in the state are historic cuts to education funding, even though there is no better return on investment to taxpayers than education," Brey said. She said it defies common sense that the state would now refuse to direct aid to students who need it most, while at the same time telling schools they are responsible for implementing new accountability systems, educator evaluation systems, and Common Core standards — a uniform standard for what students should know each year that is used by most states, among other initiatives. The public schools are responsible for all of these initiatives, Brey said, and to talk about cutting funding or refusing funding increases for schools that need it most, while siphoning more public funding away from public schools to the unaccountable voucher schools, is wrong. State Assembly Speaker-elect Robin Vos, R-Rochester, said he saw snippets of the California speech and it contained simple ideas Assembly Republicans have been talking about on the campaign trail for the last six months: reducing the income tax rate, trying to make it easier for a business to begin and thrive, and ways to make the state’s education system more accountable and produce better results. "I think it’s pretty much consistent with what we have been saying," Vos said. "I’m excited about it. I think that Gov. Walker joins a cohesive group of Legislative Republicans who are all heading in the same direction. I hope the Democrats will take our hands and work with us to try to find some common ground." Walker’s vision for the state has focused on letting families keep as much of the money they earn in their pockets as possible, and have the state do things that are necessary, but figure out ways to do that more effectively, Vos said. "He’s laying out a good first step," he said, "which is to put the agenda out there and involve the public early, and now we’ll have an opportunity for the Legislature to get involved."